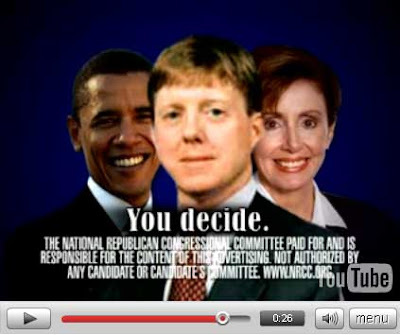 The NRCC ran their typical ad lineup in Louisana. Radical Liberal Agenda, Barack Obama! he's black ya know, and of course [shudder] Nancy Pelosi... They are trying to make her the next Hitlery Clinton, I guess. They even robo-called black voters and asked them teach white democrats a message. They told voters: You Decide. I said this at the time, Hurricane Katrina showed a lot of people exactly what happens if you follow the Republican theory through to its logical conclusion. People in Louisiana understand what government is for now and more importantly they understand that Republicans don't give 2 damns about them, or the troops, only about holding onto power and helping out their corporate buddies.